It takes over 10 hours to fly from Barcelona to India. That's almost half a day of travelling. As an Indian food lover and curry fanatic the long haul seems worth it. You would be right if you assume I'm exaggerating a little, but nonetheless I have tried my fair share of Indian restaurants all over the world, from San Francisco to London, and more recently here in Barcelona. I’ve explored many hole-in-the-wall joints and more upscale eateries. But the truth is that most of my past experiences have been lackluster at some of the better-known and recommended spots. I'm not labelling myself as a Indian food super-expert but I know quality and authenticity when its in front of me. Convinced that there has to be a great and genuine place here in the city where one can get truly bona fide Indian food - well-cooked and with fresh natural ingredients - I haven't stopped searching with my rumbling stomach and appetite for discovery. One day, out of sheer coincidence during an online search, I discovered Come Con Los Mishras (check out EatWith for other local gems). They aren’t found on TripAdvisor, Yelp, or Bon Appetite - or in any major publication or guide - and that actually might be a good thing. The merit comes in that secretly exclusive feeling and ambiance they provide, the warm-hearted service and company, and the brilliantly tasting and undoubtedly authentic dishes they create. The menu is diverse, focusing on a variety of traditional mouth-watering dishes from all over India. And to assure you are well taken care of, they only take one reservation per night for a maximum of 4 lucky guests. Come Con Los Mishras was an idea ex-ESADE Business School student Saurabh Mishra and his wife thought up. Their value proposition? Offer authentic, aptly cooked Indian food utilizing only the best ingredients and do it at a smaller scale so you can focus on making each and every single dish to perfection. You won’t find any supermarket brand curry powders being used. “We bring spices from India” Saurabh explains to me as I delightedly devour a fork-full of the rich Chicken Kundapur. “I have a passion to cook as well as entertain, that’s why we are not a traditional restaurant but rather a place to eat well and socialize” he comments. 1. Why have you started Come Con Los Mishras? It’s my entrepreneurial spirit. Besides, Farmantra - a financial services company for life sciences I founded - I teach finance which is another passion of mine. I started Come Con Los Mishras in order to diversify my risks. Also, there are several curries from my village in the east as well as delicious curries from the south of India. I thought this will be an opportunity to expose the food from these regions. 2. Where did you learn to cook? I learnt cooking myself when I was in the USA back in 2007. I was craving good Indian food and found that it was not possible for me to eat at restaurants everyday which was not only expensive but also not healthy. I started cooking as a hobby and that slowly converted to a passion of mine. I then started experimenting and cooking several dishes from different regions. 3. How long have you been cooking this type of food? I have been cooking for around 8 years. 4. How would you characterize this type of food? The food that I cook comes from different regions. In restaurants, you mostly get north Indian food such as Tandoori items, Naan, etc. At our place, you not only get food from the north India but also from south and east and many dishes that are cooked at home. Of course we do not have the Indian Tandoor oven and hence we cannot offer Naan that you get in restaurants, but the beauty about the food from all these regions is that if you are vegan/vegetarian you have hundreds of varieties of curries that are delicious and not bland. I have posted several of them on our Facebook Page (https://www.facebook.com/comeconmishras). Second, I do not burn the spices (Masalas) while cooking which is also very typical in Indian cooking. This way the benefits of having spices remain when you eat our food. We use a moderate amount of spices such that it is not very spicy yet it is delicious and healthy and something you can eat on an everyday basis. Last but not least you know what you are eating as its home cooked and we also eat with you and answer any questions you may have about Indian food or India in general. 5. What ingredients do you use, are the fresh and easy to find in Barcelona? We bring spices from India. Other herbs such as coriander leaves, fenugreek leaves, etc. are available here. 6. Where are the food and dishes from? The food is from the south, east and north. The first item you are trying tonight is usually serve (Idli) which is from the south. The marinated chicken (Hariyali chicken) is from the north. 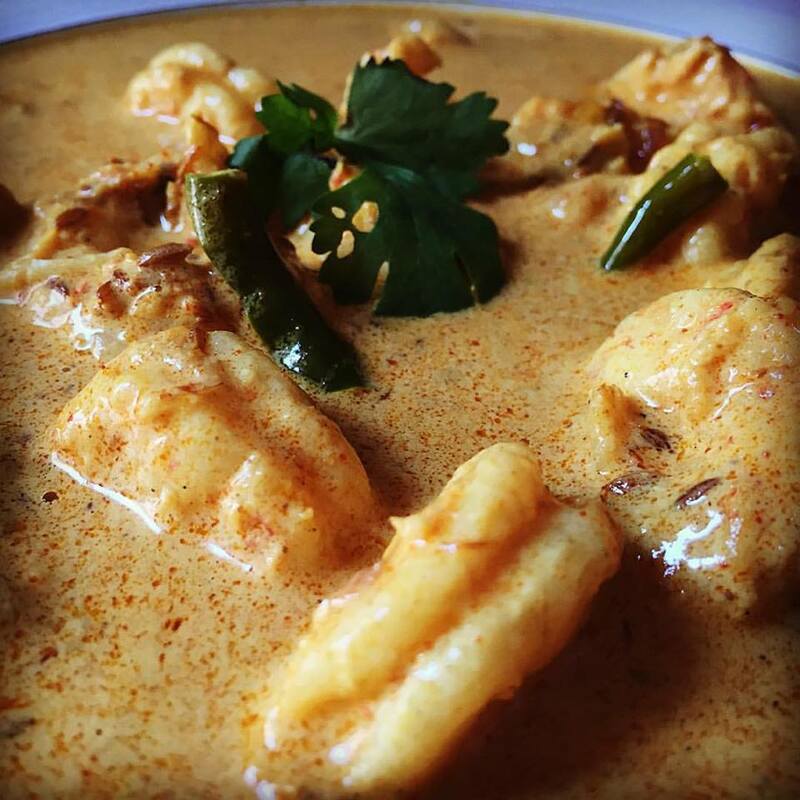 The fish curry with coconut milk that we sometimes prepare is from the coastal southwest area. Before every meal, I ask the clients by email their food preferences and any food allergies they might have before I shop for the ingredients and begin cooking. 7. What characteristics are the foods from the south of India compared to the rest? In the south are there are more fish or meat dishes? More curry dishes? The differences lie not in the use of meat or fish but in the use of spices and oils. For example, in the south using curry leaves is sine qua non. Also white lentils (Urad Daal) are used a lot and many dishes are cooked in coconut oil. In the east, Indian food, especially from Bihar and Bengal, uses mustard oil especially when making fish dishes, eggplant, and others. In the north we use cumin seeds as well as ginger garlic paste in almost all dishes. Due to the use of different spices and oils, the taste of the curries varies in every region and are very delicious as well. 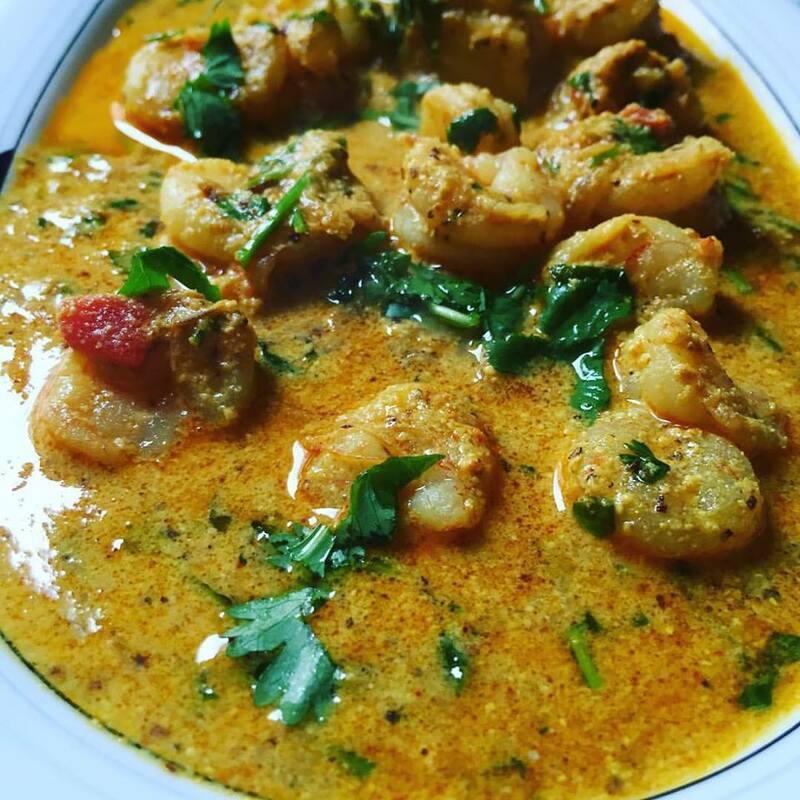 If you see this shrimp curry in coconutmilk dish it is made in mustard oil which also gives it a pungent flavor. This is a typical dish from Bengal in the eastern part of India. This shrimp curry dish, which is from the east of India – from the state of Bihar – is made in mustard oil (no coconut milk in this curry). If you are a vegan, check out this curry. Hence you can see how curries can be so different. It is difficult to get these curries in restaurants here in Barcelona that is why what we offer is unique. I’m really happy to have the opportunity to expose different foods from various regions of India, especially the curries.